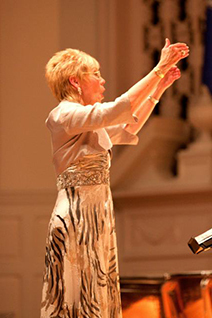 One of America’s preeminent conductors of collegiate, community and professional choral ensembles, Dr. Carole Ann Maxwell has been the Director of Choral Activities at Fairfield University since 1980. She is also the Founding Artistic Director and Conductor of The Mendelssohn Choir of Connecticut. In these and all her affiliations, Dr. Maxwell continuously strives for choral excellence through the total commitment and magnificent voices of thousands of gifted singers who gladly audition and travel great distances for the opportunity to work with her. Noted for immense energy, consummate professionalism and complete dedication to the choral arts, Dr. Maxwell’s mission is to inspire and challenge each singer’s musical potential. Combining her talent with a wonderful sense of humor has set Dr. Maxwell aside from other conductors, making her extremely unique, and placing her in great demand. Her distinctive style and artistic leadership have produced critically acclaimed results from podiums throughout the United States, Canada, Europe, and Asia. In addition, Dr. Maxwell is a favorite Chorus Master for area orchestras and is a member of the Board of The Fairfield County Children’s Choir. This year will find her choirs singing with the Norwalk Symphony Orchestra in a performance of Mahler's Symphony No. 2. Dr. Maxwell has been recognized for her artistic achievements with numerous awards. In 1992, Immaculata College presented Dr. Maxwell with the prestigious “Distinguished Music Alumna” award. The National Music Honor Society, Pi Kappa Lambda, honored her with membership citing her excellence and outstanding contributions in the field of choral music. The Connecticut Post named Dr. Maxwell a recipient of the “Woman of Substance” Award, celebrating outstanding women of the region, and Oxford Health Care honored her with its Humancare Award for her exceptional efforts in the community. In 2000, Dr. Maxwell was named “Woman of the Year” by Fairfield University Women’s Studies Program and is the 2016 recipient of the Fairfield University Distinguished Faculty/Administrator Award. Dr. Maxwell has been named to the National Jesuit Honor Society, Alpha Sigma Nu.. Note: To reduce spam, we have removed full e-mail addresses and e-mail links from our website. All Mendelssohn Choir e-mail addresses are in the format of alias @ mendelssohnchoir.com, so to reach someone whose alias is "graphics" the email address would be graphics @ mendelssohnchoir.com.